That was the question asked of you in the first Hotline Miami. It began as a simple excuse – you receive your objectives by phone, you go to the location, equip your animal mask of choice, and kill the targets brutally. Why? Well, you were told to, weren’t you? And yet when the man in the chicken mask sat in your apartment and asked you that question, you think. What possible motive could your mysterious caller have, that justifies the gory deaths of so many? Was there even a phone call? The first Hotline Miami was a Lynchian fever dream, filtered through neon and Eighties synth music, the fragmented story of a killer’s psychosis and an evisceration of violence across all media. Who could enjoy this, it asked you, after you instruct your little hitman to cleave open a man’s head with a golf club. 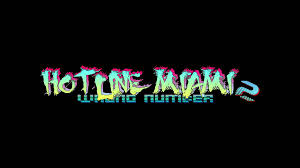 Hotline Miami 2: Wrong Number has a couple more questions for the poor gamer. Number one: why would you come back? Two: is escalation the only route for a sequel to take? No longer in control of mute hitman Jacket, the player controls several characters before, after and during the events of the first game, filling in backstory and fleshing out characters as if it were possible to explain the carnage you caused last time. The gameplay is much the same: you look down on your tiny character and the vague outline of a building. The music pulses and the colours flash. You select your mask and run in. You kill. You die. You die repeatedly. You learn the patterns, attack again and again until the music stops and you are the last person standing. This time however, the game’s contempt is stronger. Maps are far wider – just out of your vision lurk enemies with rifles who can pick you off before you notice them. They’re faster, smarter and depending on your character, you could be restricted in areas you previously thought crucial to your survival. It’s here Wrong Number particularly shines: one of the main characters, Evan, is an investigative journalist and not a violent man by any means. Pick up a gun, he removes the clip. Strike an enemy, they’re merely knocked out. Suddenly the game is flipped on its head and Evan is at the mercy of dozens of psychopaths out for blood. The consequences of violence are not so adrenaline-pumping when they’re visited on you. Hotline Miami was never subtle, and neither is Wrong Number. A large chunk of the story focuses on a group of thrill killers known as The Fans. Wearing Jacket’s animal masks from the first game, they intend to relive his glories. They are, all of them, completely repugnant. And they are you. ‘That’s what you want in a sequel right?’ the game asks. ‘More of the same?’ Another plot strand follows a movie adaptation of the first game, the director demanding more gore, more bodies, and even contemplating adding sexual violence to a pointlessly crass film that even traumatises the actors. But the game is not solely about The Fans and escalation. The writers are smarter than that. There is a sudden depth to that tacky Vice City inspired, blood-soaked Miami. No more of the mute sociopath Jacket – you control characters like Richter, helping his ailing mother climb the stairs and desperately trying to escape the blackmail that forces his double life. And then of course, you hear the sound of a tape caught in the player. The screen freezes and jumps, and the man in the chicken mask is back, sitting on the couch and judging you. This time he seems cheerful.